How to merge images in different rows? we are still working on the project as described in the following topic. The workflow is running so far, but it still needs a bit improvement. We are able to detect the bubbles, get the original shape again (Convex Hull node) and extract the diameter. But we still have the problem, that sometimes 2 or more fragments are forming one bubble. I attached some examples pictures. My idea to fix the problem with example1 is to recombine the fragments, after the convex hull node. Then the small fragments are gone and i can run the connected compound analysis again. But I had no success in recombining the images, filtered by the GroupBy node. The number of labels for each image is different, that makes it even a bit more complicated. The example2 would still exist after recombining the pictures. I guess there is no solution to detect these bubbles, so I will exclude them through a minimum roundness value. It would be great if someone could help me recombining the images separated by the GroupBy node. Maybe there is even a solution for example2. 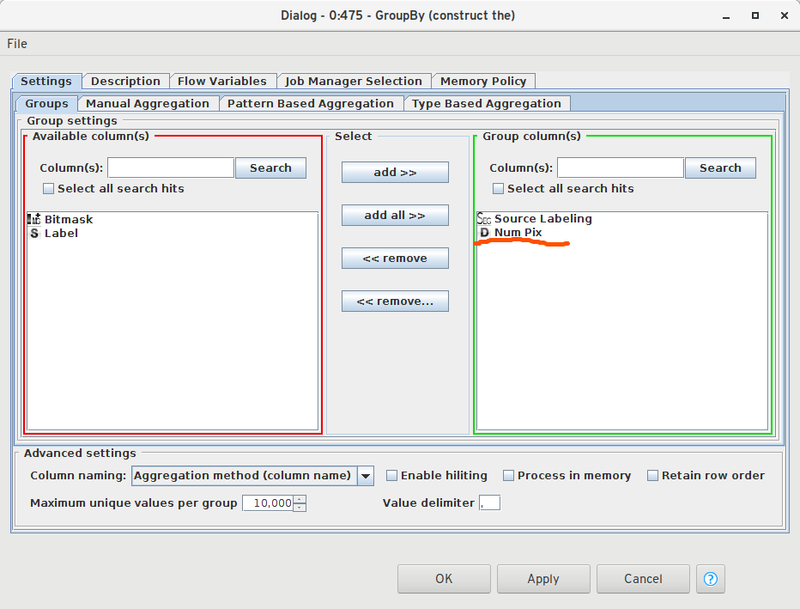 Hi I took a look at your workflow, the problem is with the settings of the Group By node: You have both the Source Labeling and the Num Pix column set as Group Columns (see screenshot), this will mean only segments with the same number of pixels and the the same source will end up in one group. I think you can improve your results if you invest a bit more time into the pre-processing of the images before you perform the thresholding, e.g. in cleaning up the background and making the bubble edges more prominent, currently this has still much room for improvement. In the attached workflow I added a few tips how to improve the first steps of your workflow to get you started.